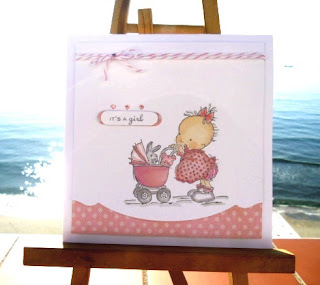 Absoloutely gorgeous card....such a cute image and beautiful colouring....and please can I come and photgraph my cards where you are...it looks amazing!! A sweet card. Such a warm and children. Beautifully pokolorowałaś stamp. I'm very impressed. What an adorable image Sylvie reminds me of Mabel Lucie Attwell! We've got sun too!!!! Lovely card. The image is so cute and beautifully coloured. Oh my gosh - this is way too cute and I am going to have this image for sure. How very cute is this - love it!! Hope you are well too sweet lady but from what I see, you are not only well but happy. We are having a rainy cool spring. But that is fine by me, I feed my critters and am happy! This is a real sweetie Sylvie! We had a lovely warm sunny day today too! This card is so precious love the colors! I do like the baby image - it is just so cute! REally pretty too! Superb your card! I love this image that you have tastefully colored.